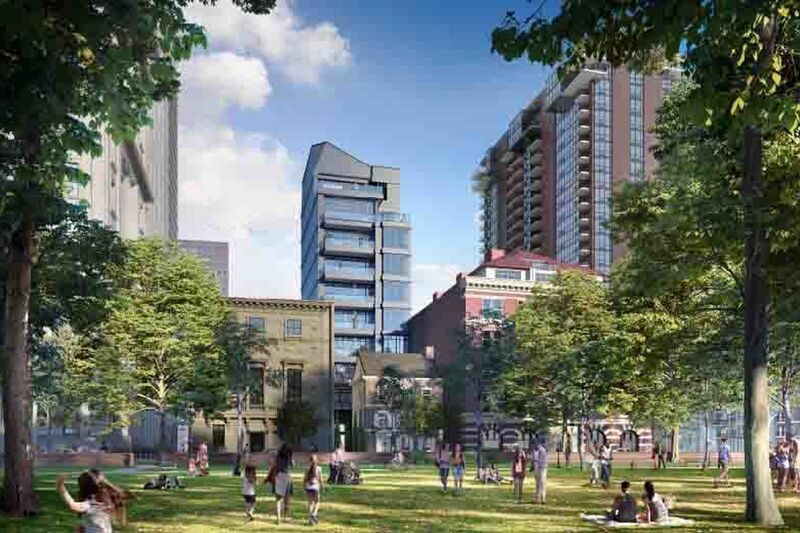 A view of the 12-story tower proposed for the site of the Dilworth House. Developer John Turchi Jr. plans to keep the facade of the home, while building the tower behind it. The Philadelphia Historical Commission on Friday approved the demolition of a portion of the Dilworth House, a Washington Square property that has been the subject of a more-than-decade-long fight over its history and potential redevelopment. The vote by the appointed body represents a significant step for the property, which is regarded as historical not for its age but for its location and symbolism. When Society Hill was languishing in the mid-20th century, Mayor Richardson Dilworth reportedly signified his commitment to the area by moving his family there. He commissioned architect G. Edwin Brumbaugh to build him a house — a reconstruction in the Georgian style — in the late 1950s, and lived there until his death in 1974. Workers in 2017 prepare to paint the Dilworth House in Washington Square. At the time, the home had been cited for violations by the city’s Department of Licenses and Inspections. The Friday hearing — which lasted for more than two hours and was at the end of a nearly eight-hour-long commission meeting — grew tense at times as commission members challenged the development’s opponents about specifying to what exactly they were opposed. “We’re all getting kind of to the end of our rope,” one member of the commission said shortly after 4 p.m., amid testimony from two opponents who implored the commission not to just reaffirm a previous 2007 Historical Commission decision on the project. In 2007, the commission voted to approve a similar proposal by Turchi, allowing him to demolish the rear wing of the property as long as the front portion of the home, including its redbrick facade, was preserved. He planned a 16-story tower. Around that time, Turchi planned 12 condos, which he intended to sell for $4 million apiece. That decision came after more than three years of tug-of-war between neighbors and Turchi. The developer and his wife purchased the property in 2001 for $1.75 million, records show, originally with plans to renovate and move in. Yet those plans shifted a few years later to full demolition, then partial demolition, and then largely no demolition at all, to make room for a high-rise designed by the noted architect Robert Venturi — something that some Society Hill members opposed, too. A view of the 200 block of South Sixth Street, including the Dilworth House, center. Soon after the 2007 vote, residents appealed the decision, and in 2008, the Department of Licenses and Inspections Review Board sided with them, overturning the historical panel. More appeals continued until 2015, when Commonwealth Court reinstated the Historical Commission’s 2007 decision, allowing Turchi to proceed. Ultimately, Turchi applied for permits in December for the 12-story tower, which will contain 10 units, as well as 20 underground automated valet parking spaces to be accessed from Randolph Street, behind the Dilworth House. According to a draft of plans, the tower would be connected to the front portion of the Dilworth House, and some of the units appear to extend into the home. According to Friday’s presentation by David Ertz of Cope Linder Architects, the tower will be constructed with clear, nonreflective glass and staggered zinc panels to mimic the slate roof of the Dilworth House. The high-rise will include balconies and roof decks, the December permits show. Ertz said Friday that the new construction would be set back so far that it would not block the windows of the Lippincott condos next door, adding that the tower is designed to not be seen when standing directly in front of the Dilworth House. “You will, of course, notice it from [Washington Square] as our renderings show, but we think it’s back far enough so that it will become a background building to the Dilworth House,” Ertz told the commission. Though Turchi now has a partial-demolition approval, he must appear before the Art Commission for final approval in May. (The commission gave preliminary approval in March.) In addition, a zoning appeal from the Society Hill Civic Association is outstanding. According to the city, Turchi’s plans can be built under current zoning as long as he receives Historical and Art Commission approvals.